Jim Hagedorn proved persistence pays off when the southern Minnesota Republican won a U.S. House seat in Tuesday's election. After losing twice to now-governor-elect Tim Walz, Hagedorn found the third time was just barely the charm. But the first district's rural areas stuck with Hagedorn, and President Trump, to seal the victory. Hagedorn told MPR News that one of the reasons he won is because voters liked his strong support of President Trump. Hagedorn said voters choose his hard-right stance over the left leaning positions of Democratic opponent Dan Feehan. "I think down in a conservative-oriented district like here in southern Minnesota that clear choice maybe proved the difference," said Hagedorn. But just barely. 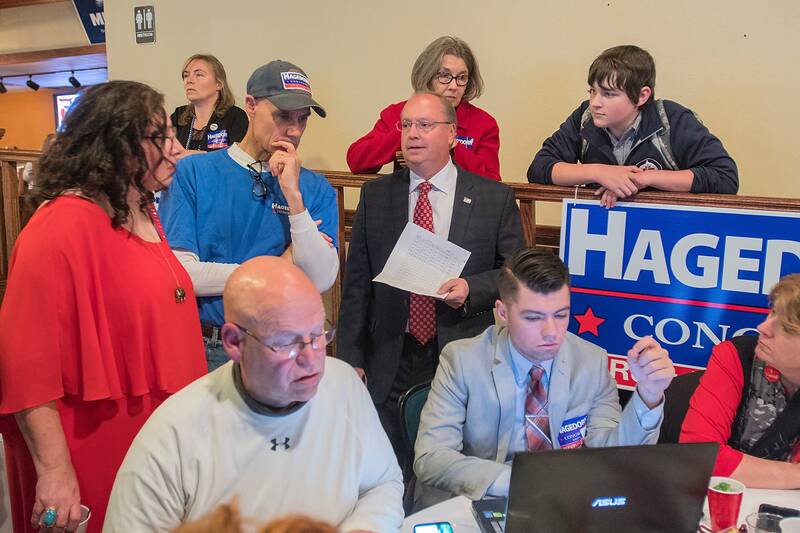 Hagedorn won by a little over 1,300 votes in unofficial results, a difference of less than one-half a percentage point out of nearly 300,000 ballots cast. Feehan has not yet conceded as he waits for the official vote canvass later this month. Democrats hoped Trump's trade war with China and other nations would drive farmers and other rural residents to their side. Soybean prices dropped 20 percent after the tariffs began, hurting revenue in Minnesota's farm country. But for the most part it appears farmers stuck with Trump, and Trump-supporting Republicans like Hagedorn, said Minnesota State University Mankato political science professor Kevin Parsneau. "From anecdotal evidence and hearing people call in on radio shows and that sort of thing, they seem to be willing to wait it out and see whether Trump's policies work," Parsneau added. "The backlash never occurred." County vote totals appear to back that up. Feehan won the 1st District's urban centers, including Rochester and Mankato. Hagedorn thrived in the more rural counties; in most, he equaled or exceeded his 2016 vote totals. He also came within a few percentage points of Trump's numbers two years ago. One factor that may have helped convince farmers to stay with the president and vote Hagedorn was Trump's $12 billion agricultural assistance program announced last summer. It was especially lucrative for soybean farmers, sending them a federal payment to offset income lost to falling prices. The payments helped, but many farmers were committed to the president no matter what happened, said Hagedorn supporter and southern Minnesota farmer Mark Nowak. "They like Donald Trump. They like his policies. They like what he's accomplished," said Nowak. "And they have the belief that he's going to be successful again with working out a deal with the Chinese because we've seen Donald Trump deliver on just about everything he promised." Farmers like Trump's rollback of regulations affecting agriculture, and they also tend to agree with the president's social positions, such as opposition to abortion, Nowak added. Even with that support, Hagedorn's lead was razor-thin as many in the district saw the election as a chance to reject Trump. Joel Krekelberg of Worthington said he sometimes votes Republican, but that there was no chance of that this year. He doesn't like Trump and he's happy the Democrats won control of the U.S. House. "The Republican party didn't do their job as far as I'm concerned in the Congress, in being a check on him," said Krekelberg. "They just looked the other way."